Since the very beginning, Starbucks Mission and Values have reflected our fundamental principle that we welcome everyone. That belief has resulted in an unrelenting dedication to foster a diverse, inclusive and equitable environment for our partners (employees), customers and the communities we serve. 67% of our U.S. partners (employees) are women. Of our vice presidents (VPs), 49% are women. 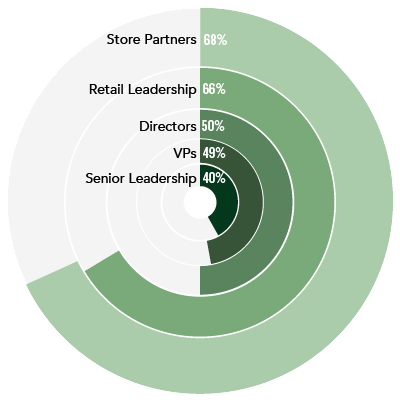 Of our senior leaders, 40% are women. 45% of our U.S. partners are minorities. Of our vice presidents (VPs), 28% are minorities. Of our senior leaders, 19% are minorities. 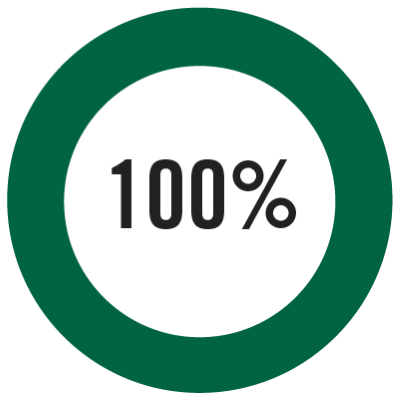 Starbucks has achieved 100% pay equity for women and men and people of all races performing similar work in the United States. In 2015 we set a goal to increase the female and minority representation of our senior leadership (approximately 50-60 SVP+) by 50%. We achieved that goal for women in 2018 – two years early – and have raised the bar even higher. By the end of 2020, we aspire to have 50% women at the senior leadership level and to achieve our goal of increasing minority representation by 50% over our 2015 number. Provide Inclusion training and tools to people managers to ensure that we are preparing all leaders to foster a diverse and inclusive culture based on merit. 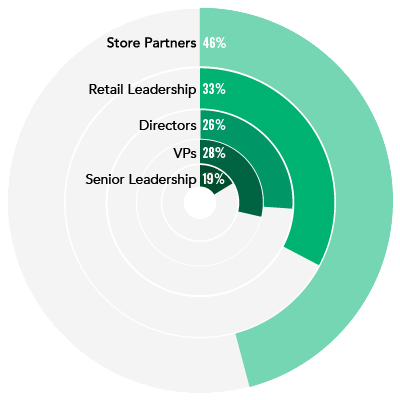 Provide diversity education for retail partners. Drive leader accountability for diversity and inclusion outcomes. Increase internal pipeline of diverse leaders at VP and director level. To expand our talent pools, we will continue to partner with community-based youth organizations and educational institutions to achieve our Opportunity Youth hiring goal and College Achievement Plan pathway. Achieve and maintain 100% gender pay equity for our partners in all company-operated markets globally. Read more about our efforts here. In all that we do, we will continue to strive to create a culture of belonging–where everyone is welcome–so that we can continue to drive innovation and growth through our people.